The seventieth anniversary of the beginning of World War II is being commemorated across the world this year, and a number of media organizations are drawing on their own historic archives to offer a bit of perspective on that moment in world history. The Telegraph is one such organization, and they have created this fine collection of essays, video clips, photo galleries, and original articles from the fall of 1939. In the “As It Happened” area, visitors can view the original articles from the Telegraph and offer their own comments on these events. On the right-hand side of the page, a video player offers clips from newsreels of the day which document subjects like air raids and the movement of important cultural items away from potential bombing sites. The homepage also contains a “WW2 In Focus” area which features commentaries from former soldiers, evacuees, and reporters revisiting key sites around Europe for a bit of perspective on these events. 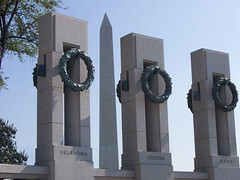 This entry was posted in Articles, History, Images, Photos, Video and tagged World War II. Bookmark the permalink.